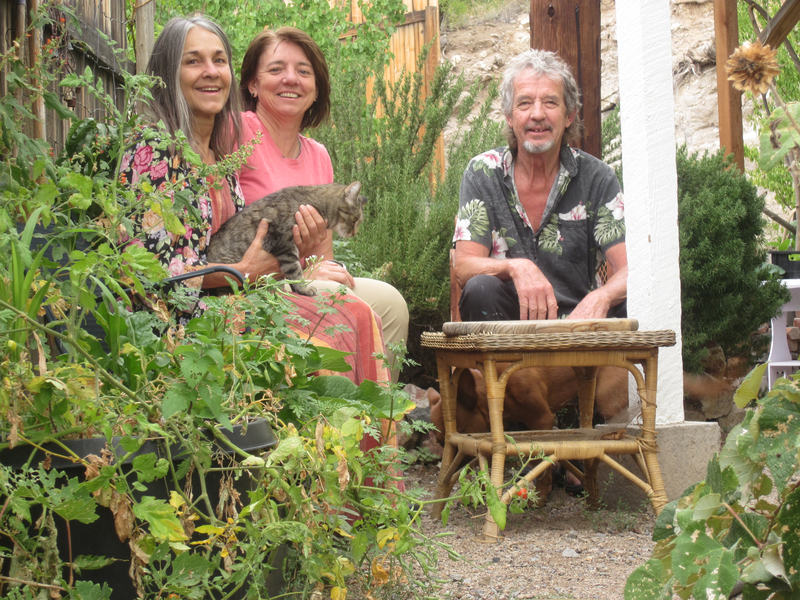 Author Jean Eisenhower with friend Darlene Dabroslavic, partner Greg Renfro, and cat Peaches. Wonderful to be out in the garden again! Sitting. Yes, sitting. I haven’t felt like working much yet this year. Maybe I’m recovering from doing so very much last summer. I often ask myself why this space nurtures me so well. It’s not just one or a couple of things. We’re connected to a vast Universe, all of it impacting us in different ways, as we impact our yards and gardens in different ways, all of it requiring consideration. My neighbors have seen my yard slowly transform over the past eight years, from the solid granite hill cut with elm trees and four other major living plants, to an elm-cleared weedy lot with barren structures of fence posts, swales, and materials piles, to a cedar-fenced enclosure with a half-dozen young trees peeking above (and lots more unseen inside) with experimental plantings on the outside. It’s been a slow go. It’s a complex process to create something not just aesthetic, but ecologically-responsible, functional, productive, socially nurturing, self-nurturing, ergonomic, and economic! It’s not something to knock out on paper in an afternoon and then hire the workers to complete next week. 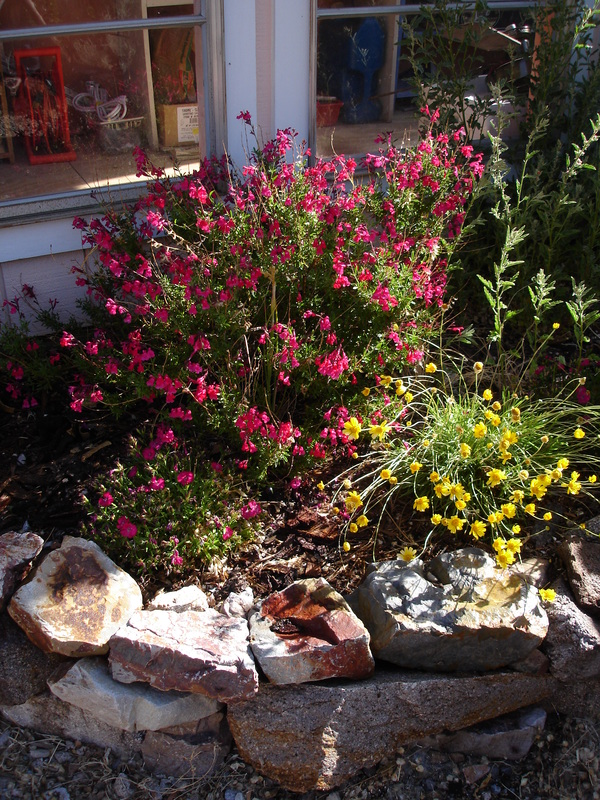 Our yards are ecosystems we’re creating of uncountable living beings, all interacting. The design task challenges our creativity and our consciousness. The result is a harmonious gathering of living beings to share our space on quiet mornings, nurturing, inspiring, and healing. If I could wish anything for everyone on this planet, it would be a garden that nurtures them, body, mind, and soul. Modern life subjects us to a lot of stimuli and has taken most of us away from the natural, living world to some degree, so it’s important for us to create at least a small natural space where we can be free of overstimulation, including social stimuli. Fences or hedges seem essential to most people who want to spend time outdoors. The most beautiful items, I assert, are found in nature: stones, trees, flowers, and all plants. A yard needs nothing more to create beauty. If we need to introduce manufactured items, for instance to build a fence, the more natural the better. Garden hoses, plastic tubs, trashcans can all be stored in a single location, maybe shielded, leaving all the rest of yard for feasting the eyes on natural colors, lines, textures, and shapes. When we must have a manufactured item in those areas, for instance, chairs, the colors and textures should be harmonious. Lines in the yard needn’t be rectilinear. Paths and fences can meander, and patios should be shaped organically to suit their function. Rectangles have their place in modern efficiency, but we’re not packing patios into the back yard! Often, we just have one, and it should be shaped to support the life on it and surrounding it. What will be on and around it? Hold that thought. 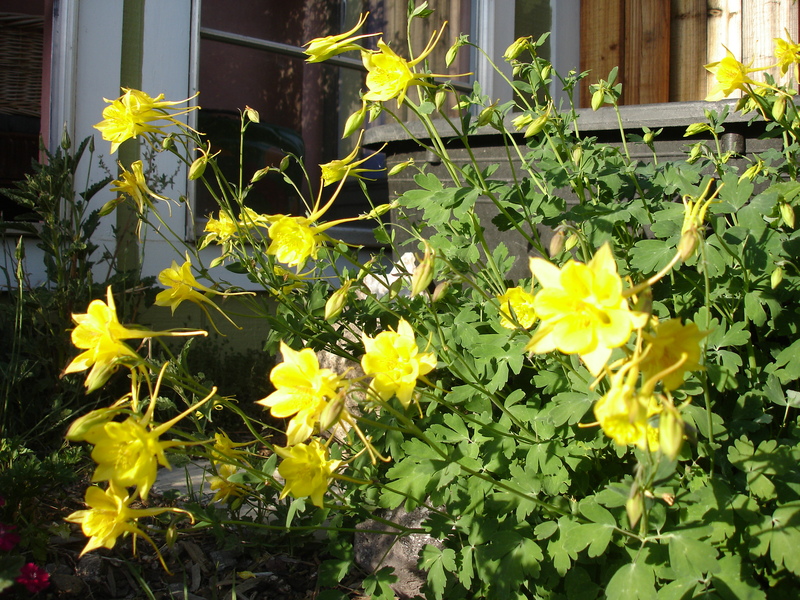 Columbines thrive next to (and hide) the plastic water container we keep full for birds – and hopefully for a little aquaculture one day! Color! Who doesn’t thrill at the first spring flowers? Flowers bring us such wonderful lessons in harmony and aesthetics in every iris, columbine, rose, garden sage spike, evening primrose, twining morning glory, and even my beloved, modest globe mallow (she’s a healer, you know). And prickle poppies, thistles (please don’t mow them down, City! ), elderberry, desert willow, fairy duster, and all the others unnamed. And these are just the flowers that grow with almost no effort! Please don’t be too practical (like I used to be) and think that all the soil needs to be in vegetable production! Allow the flowers, and then learn what they’re good for. Dandelion, for instance, is excellent medicine. Flowers, if we understand them and use their medicine appropriately, might even save us thousands of dollars in health care! 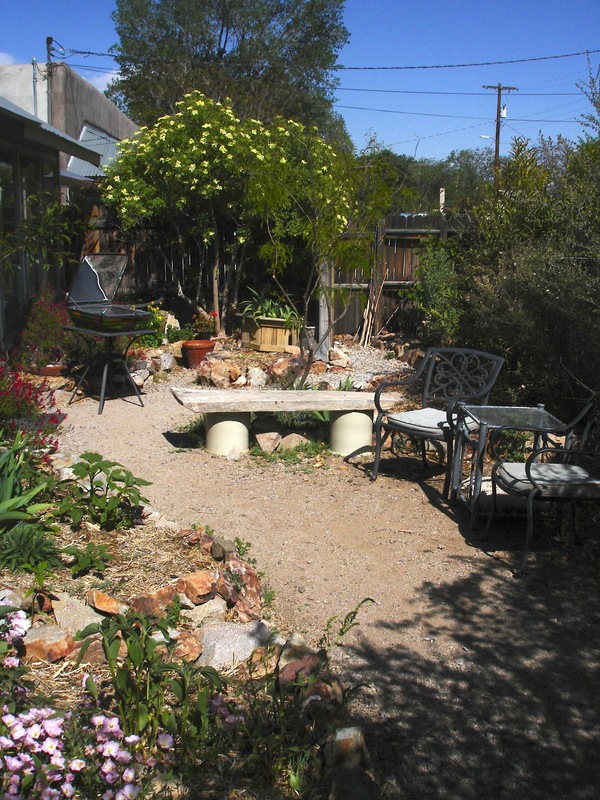 This formerly-rectangular yard was made both more attractive and more functional by expanding the edge gardens toward the center, leaving just enough room for walkways and seating. Don’t start those lines meandering until you’ve considered as many functions of your yard as you can possibly imagine. Where do you need to walk the most often, less often, or once a year? What do you need to store? Try to think of everything, and then add more space for the unexpected. What are your physical needs? Those of your family and friends? Consider the future and decide where you might want to plan paths, now or later, wide enough for a wheelchair. Do you want to change the location of anything? Is your hose bib in the sun in winter? 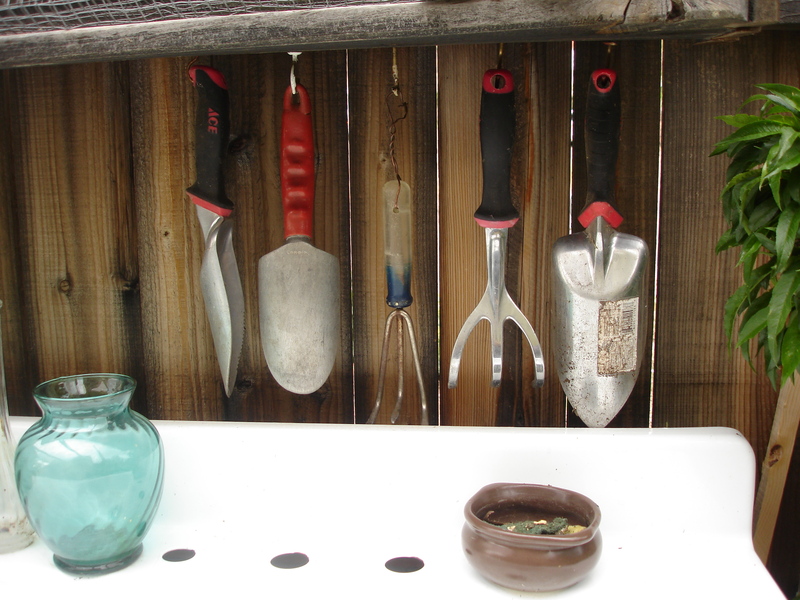 Is your compost near the back door, but not too near? Are your gardens convenient to the kitchen, especially beds of things you use often, like herbs, or need to check regularly, like those zucchini? Do you have furniture that lets you enjoy the yard fully? Do you need a place for people or animals to play? Do you like the idea of a social space for friends to gather? If so, what’s needed for that? Would an outdoor fireplace extend your enjoyment of your yard? Do you have a work table outside, to clean all that harvested food or those flowers before bringing them inside? Soon we’ll plumb this enameled-metal sink – with solar-heated water – for lots of planting and clean-up convenience! Underneath there’s lots of good storage. Is anything too low or too high for comfort? Can you change that? Straight rows of vegetables have a few advantages, easily accepting rectangular shading and rectangular cold frame boxes. But there are advantages in a circle too! A 6-foot-diameter round garden with a “keyhole” entry to the center allows the gardener to access it all from one spot, and – best – let’s the gardener twist and turn ergonomically, healthily, while tending the plants! Windows in full sun on the Winter Solstice! Windows in full shade on the Summer Solstice! 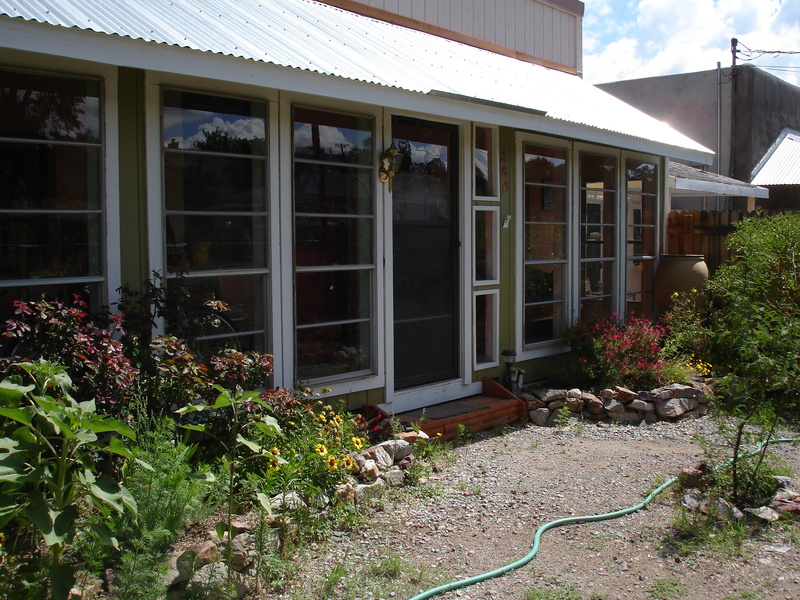 A well-designed yard with appropriate passive solar design can save hundreds of dollars each year in energy and water bills, and can provide as much in food and herbal medicines. If you compost and recycle, you’ll help the whole community with landfill costs and be able to amend your soil for free. A good design can also add living space, and that and the beauty will enhance the value of your home. And maybe your yard or garden can help you earn an income. If you ever get more food than you can eat or easily process, consider a simple food dryer. It’s a huge money-saver and time-saver over canning. 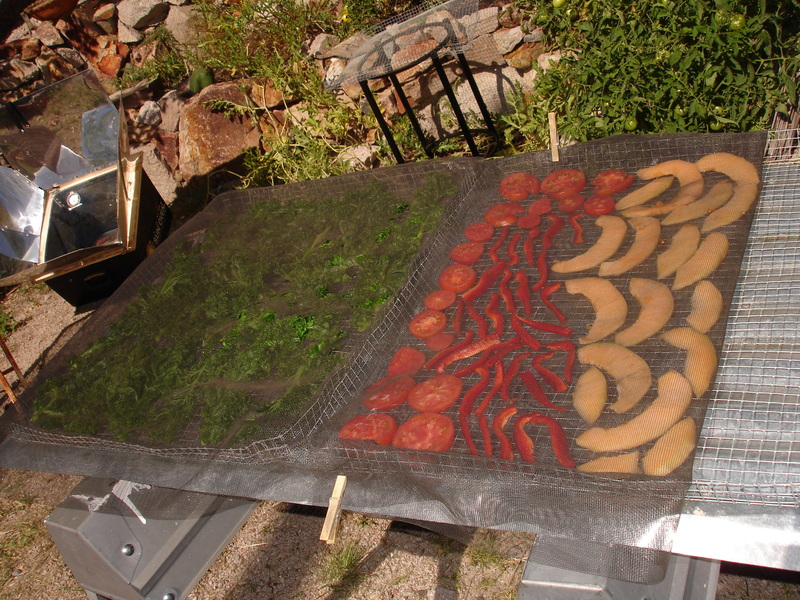 These home-made food drying trays are made of hardware cloth, lined with plastic window screen and shielded from insects with the same, sitting on reflective corrugated metal – easy to construct and easy to break down and store. Ditto drying your clothes on a line outside. Do you have a good place in the sun for the line? Consider those that roll-up against the side of the house. Solar ovens also save money, and we users insist the food tastes better! 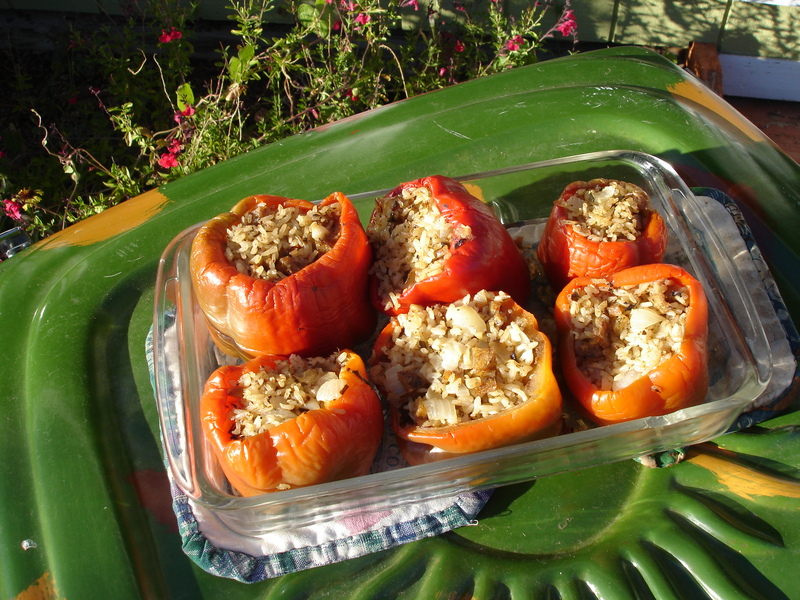 Stuffed bell peppers cooking with the sun – a summer favorite! Also consider an outdoor shower or tub, to cool off when working outside and then to recycle the water into the garden – another savings! Refreshing, convenient, and the bathwater doubles as plant water! 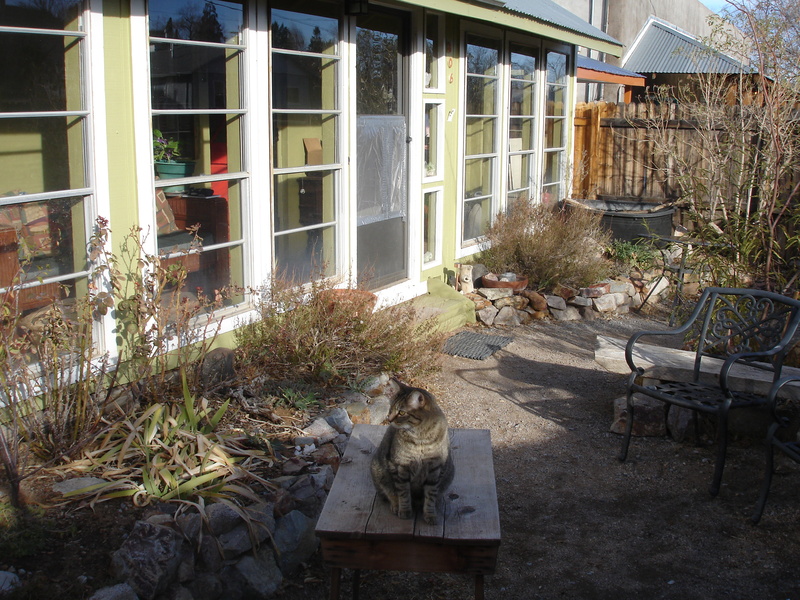 No need for plastic patio mist machines when you have good passive solar design. That means planning to get solar radiation in the winter to your home and patio – and gardens, compost, chickens, dog house, hose bibs, etc, while protecting many of those elements from the sun in summer. Since the winter sun cuts a low arc across the southern sky and the summer sun rises and sets northerly and crosses the sky higher overhead, we can plan to get solar gain to specific elements in winter and shade some of them from the east, west, and overhead in summer. It’s a great puzzle! Not only 3-D, but changing though time – the fourth dimension – the seasons and years, as trees and other shade-producing plants grow and deciduous ones lose and regain their leaves every year! Yes, a puzzle-worker’s delight – in 4-D! ALL the roof water descends on this one corner. 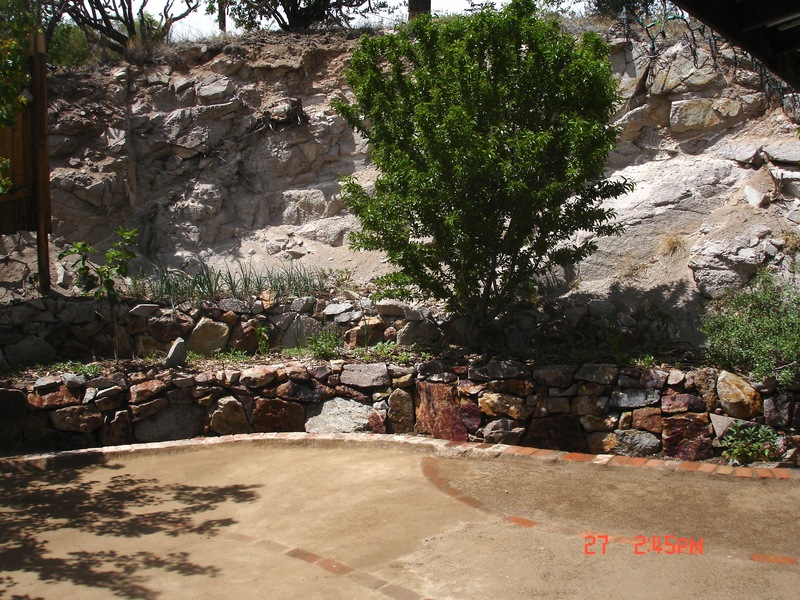 Whatever overflows the tank is directed alongside the swale (“low place”) around the patio alongside the fruit trees! Then there’s water. We’ve recently joined billions of people all over the planet who need to fight to protect their water source. And with the weather becoming increasingly erratic, the water concern is even greater. 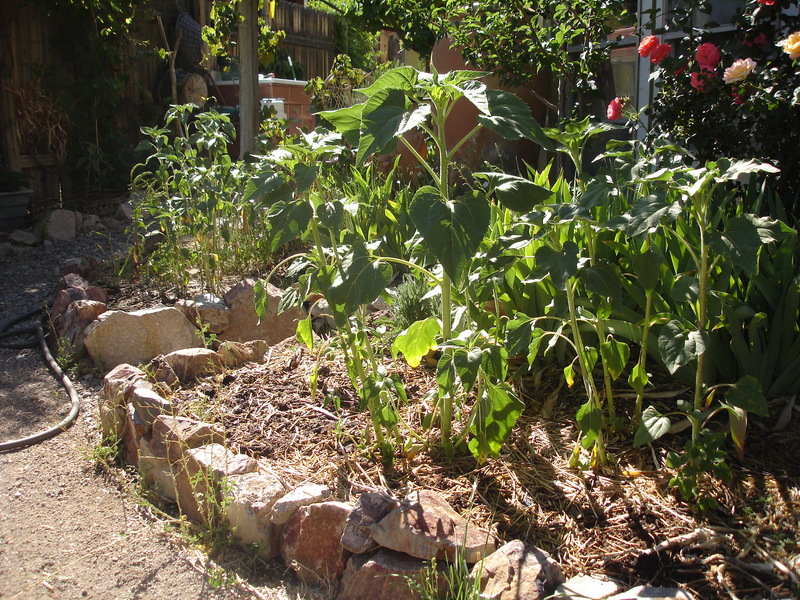 So, to be responsible for our water use, we must heavily mulch our gardens, plant appropriate desert-adapted species, and use as efficiently as possible the rainwater that falls on our property. Since the average American roof can harvest 1,000 gallons in a good rainfall, it makes sense to either save it in tanks or direct it to collect in gentle swales, shallow depressions. These are most attractive when they are shallow, perhaps just a few inches deep, and especially when they meander across your property, maybe alongside your pathways, providing a place for herbs, flowers, and trees. There’s no sense in letting the water flood the street – or flood your yard and paths. Design! Plastic offends my sensibilities, though obviously modern life demands that we accept it. Still, I see no need to have any more of it in my private garden than is necessary. So I pay more for products that will one day go back to the Earth easily and naturally, and I discover there’s an awful lot of stuff that just isn’t necessary. Plastic garden hoses I don’t know how to get around. 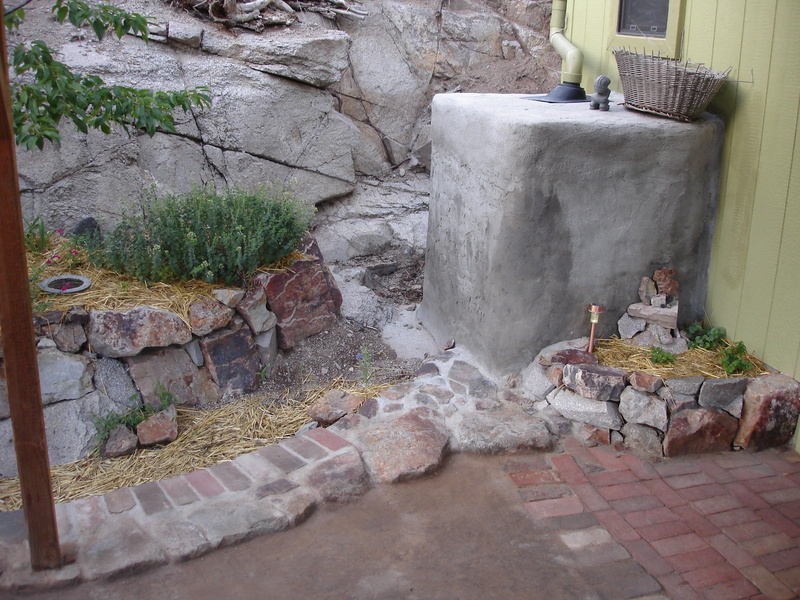 Our water harvesting tank, recycled from a natural food container, was ugly to me, so we plastered over it to blend in with the granite hillside. We buy nothing toxic at the nursery, except for one thing to eradicate the elm trees – an invasive species that will kill off all competitors. If anyone knows of a natural option, please let me know, and I’ll spread the word far and wide. To the right of our front door, “Johnny Jump-ups” (little blue and white violas) were recently seeded beneath the straw mulch. 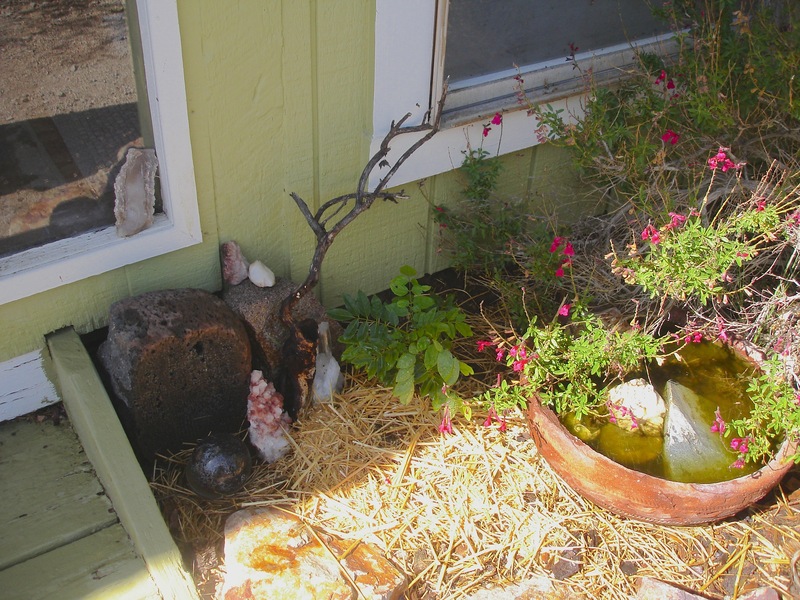 To the right is a pottery bowl always kept full of water for small wildlife. Near the stones and crystals is a young wisteria that’ll one day cascade its blooms in an arch over the doorway! 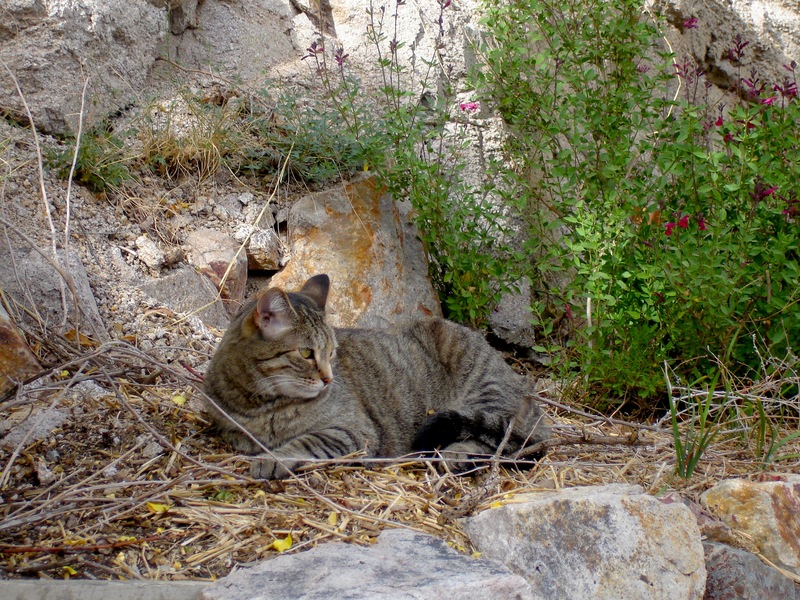 All wildlife is stressed these days, but our yards can provide some habitat by including native species. It’s best to avoid bird-feeders (using seed from mono-culture crops elsewhere that destroyed native habitat, and requiring long-distance transportation and plastic bags), but the old birdseed can be allowed the sprout where it has fallen, then the stalks can be gathered and set out for the birds, to fall and sprout again. But the local, native food, of course, is best. 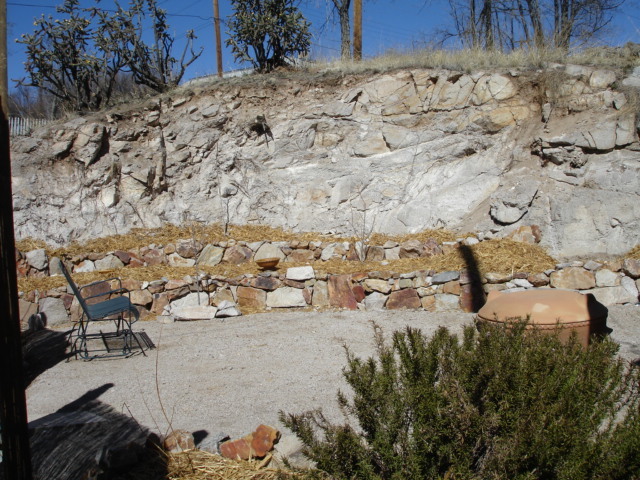 Lizards love stones for their homes and can be counted on to provide a degree of free insect control, so be sure to use piles of stones in your yard. And bat houses (designs online) can do even more. If you have deer in your neighborhood, please don’t feed them. They quit eating what’s healthiest for them, then bother your neighbors, and eventually get moved and/or killed by Game and Fish. The more I work this puzzle, try to put together my own little, healthy living ecosystem on this barren granite hill cut (a desert in a desert, coming to new life), the more impressed I am by the fragility and resiliency of life. I think now before I put a blade into the soil. The micro-organisms, fungi, worms, and other lifeforms don’t like the light and dry air and will quickly die. Do I need to do what I’m doing? If so, perhaps I can mitigate my activities. As gardener, I have the life of every living thing in this garden in my hands. I’m like God to these beings – or Goddess. Am I conscious of this responsibility? Not always, I’m sorry to say, but I’m becoming more so. Finally, I’ll admit that I’ve been blessed to experience the Mysterious in the garden – Intelligences that have been given many names throughout time: elementals, devas, faeries, gnomes, sprites, undines, etc. 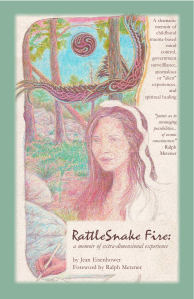 Whatever their names, they’ve been described by philosophers of different eras, Paracelsus and Rudolph Steiner, in particular, and many other mystics throughout time. These intelligences are credited with the health of all living things on the planet. We might forego those other names and just call them the life force. In any case, the life force is intelligent, powerful, healing, and essential – not just for our gardens, but for us. If we respect It, it respects us and can help us. Peaches enjoys a place in the garden I haven’t yet made inaccessible to her this year by laying pruned tree limbs across them. And so the garden blesses me whenever I take the time to sit in it. 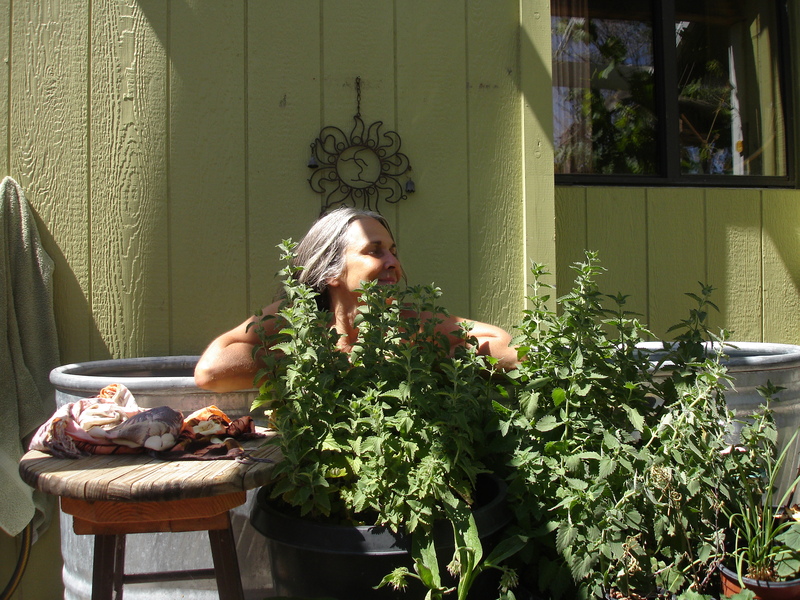 It gives me beauty, privacy, relaxation, healthy food (for family and chickens), herbal medicines, water I can use, sun when I want it, shade when I want it, comfort, ease, entertainment, delight, and a place for friends to gather now and then. It also helps me be consciousness of the infinite intelligence of our cosmos. Jean Eisenhower is proprietor and designer at Home and Garden Inspiration. She loves consulting to help others design their gardens! This article is also posted online here It’s online here – http://www.desertexposure.com/201406/prt_201406_bms_ecosystem.php – but with only one photo.